For all that we know about Sherlock Holmes there is much that is a complete and total mystery about him - and, as he would say himself, a that is a puzzle that should be addressed: is it any wonder that so many of us have scratched our much-smaller craniums and pondered his relationships, trying to use his own maxim of "when you have excluded the impossible, whatever remains, however improbable, must be the truth" to peer down deep into those mysteries? This timely collection focuses on his unmentioned private life. In short, the great detective's amorous inclinations, the part of life Victorians were so silent on, but so profligate in its practice. 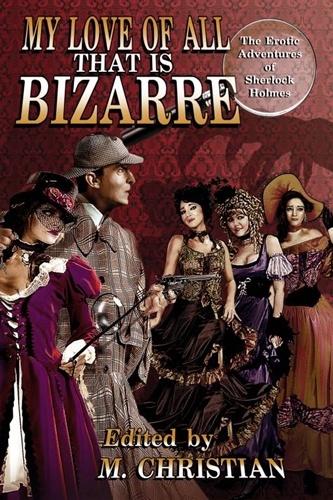 And the authors don't stop there - you will also find stories about the sexual side of other key characters who make up the canon: Irene Adler, Mrs. Hudson, Dr. Watson, and even that most infamous of villains, Professor Moriarty. Included are many of today's most popular authors including Michael Kurland (American Book Award and Edgar Award finalist), Angela Caperton (Mammoth Book of Best New Erotica), M. Christian (Lambda Award finalist), and such other distinguished practitioners of the short story and novelette as Cesar Sanchez Zapata, Kate Lear, Wade Heaton, Dorla Moorehouse, Ivo Benengeli, Billierosie, Zachary Jean, PM White, and Violet Vernet. As Holmes himself said: "The game is afoot. Not a word! Into your clothes and come!"